Judging by pure credentials, Al Thornton should be dominating this conference, but a couple of other imports are ranked higher than him right now. And with former Best Imports Wayne Chism and Rob Dozier out of commission, it’s open season for the other foreign reinforcements. 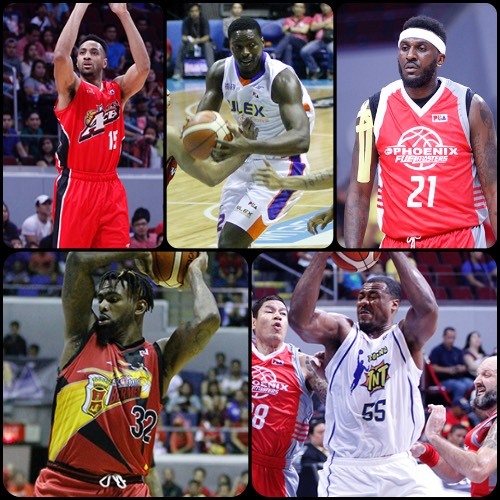 Who are the best imports of the 2016 PBA Commissioner’s Cup? Find out here! *This is based on the Player Efficiency ratings as calculated by PBA-Online.net. Stats are accurate as of February 28, 2016. - Edwards has been more than a two-game stand-in for the injured Dozier. The 6’7 California native has wowed the crowds and has led Alaska to two big wins (over TNT and ROS — last year’s conference finalists — no less). He has proven to be a high-scoring, double-double machine who can also hit from long range. He’s big enough to play the 5 in the PBA, but has the skill-set to be a dangerous swingman as well. Looks like it’s just what the doctor ordered for the Aces. - The former Boston Celtic and University of Nevada at Reno Wolfpack cager is one of the tallest imports in the league right now, and he played like it in Phoenix’s loss to Tropang TNT. Pinkney dominated the boards, but he struggled with his shot, hitting only 6 of 21 from the floor. He got to the line 18 times, though, which is a good sign, but if the Fuel Masters harbor any hopes of moving up, this 32 year old big man has to flex more muscle. - Thornton is putting up better numbers this season compared to his performance last season, and that’s certainly a bright spot for the Road Warriors, who haven’t been able to put together back-to-back wins yet. The former Florida State Seminole has been pretty much on fire this year, making 53% of his field goals including 46% of his threes. If he can just get more of his teammates involevd and play better defense, he’d be the total package. - The former KBL import struggled a little bit in his debut, but he really caught everyone’s attention with his 7 triples in the Beermen’s victory over GlobalPort. His 52-point output will surely go down as one of the most amazing this season, and I don’t think we should expect any signs of this guy slowing down. At 27 years old, Wilkerson is in his prime, and the former Marshall Univerity Thundering Herd big guy looks to be a terrific complement for reigning MVP June Mar Fajardo. - Simon finally suited up for Tropang TNT in their loss to Alaska last week, but he bounced back well by leading TNT to a W over Phoenix a few nights after. Just like what is expected of an import for TNT, Simon isn’t the most versatile guy around, but what he can do, he does really well. Simon is a classic interior operator. He scores well around the hoop, grabs rebounds by the truckload, and blocks shots like crazy. Imagine a taller Ivan Johnson (minus the outside shooting) who doesn’t go around hitting people and spewing F bombs.